characterful farmhouse with 160 square meters of living space and a large garden, enough space for children to play and excellent area for dogs. You use the garden alone, no neighbors or private use of the garden and the house while you are there. 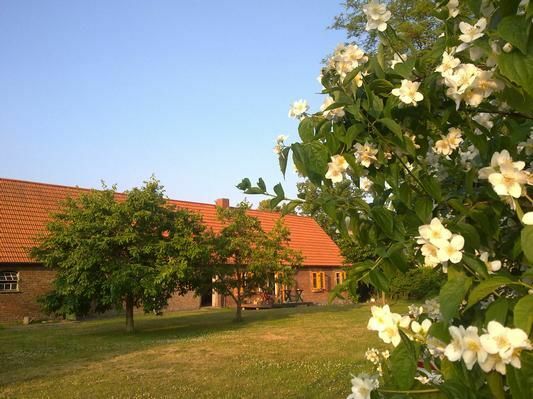 Rare North German long house (40 meters long) directly at the forest. Combined with Scandinavian-modern architecture. New and modern efficient heating. Drinking water filter system for the whole house. The equipment also includes a baby travel bed, a baby chair at table height, a baby bath tub, changing mattress cover, tote cup and baby sleeping bag. Two very well equipped kitchens. Three bedrooms for 6 persons, max 10 persons. 2 living rooms provide a retreat. Daylight bathroom with tub and modern shower screen. Wi-Fi, Smart TV, DVD player, radio, washing machine and dishwasher. New garden furniture and modern barbecue. There is a large terrace towards the garden. After a day on the beach, you can enjoy the sunset on the terrace with a glass of wine in the evening. Quiet hinterland, no noise pollution by tourist crowds. Only 10 km to the Baltic Sea. sufficient parking space directly on the private property. Numerous Freizeitmögichkeiten in the area, such as paddling on the Peenestrom to Biberburgen at Anklam, rocket museum Peenemünde, riding stables, herb garden in Puhlow, museum harbor in Greifswald, boat trips on the Bodden to Szczecin, steep coast in Ückeritz, smoked fish directly from the cutter in Freest or Wieck Greifswald, oldest hand-operated drawbridge in Northern Germany in Greifswald, 800 year old monastery Eldena, Hanse shipyard, Ozeaneum Stralsund with sail training ship Gorch Fock, numerous piers with good restaurants for coffee and cake, old town and churches of Greifswald and Stralsund are UNESCO World Heritage Site. Uni Greifswald, founded in 1446, is one of the oldest in Central Europe, was part of Sweden for 200 years, right next door is the Vorpommersche Landesmuseum with many suggestions for kids and a very good restaurant. Parking: per object and day costs in the amount of (optional). Gas: per object and day Costs of 4. 5 EUR (compulsory). Cot: to rent per object per week for 20 EUR (optional). Internet: per object and week costs of 15 EUR (compulsory). Electricity: per object and week costs of 35 EUR (compulsory). Final cleaning: per object and week costs in the amount of 150 EUR (obligatory). Einfaches Ambiente. Räumlichkeiten zu klein für bis zu 10 Personen. Wohnzimmer kann nicht für alle Feriengäste genutzt werden, da keine bequeme Sitzmöglichkeiten vorhanden sind. Besonders schlimm ist , das nur ein WC ( mit Duschbad ) vorhanden ist. Schlafmöglichkeiten sind alle unbequem ( Matratzen durchgelegen und auch nicht gerade hygienisch ). Grundstück ist schön groß und gerade für Familien mit Hund gut geeignet. Bitte vorher das Grundstück ablaufen,und auf Lücken in der Heckenbegrenzung zur Straße absuchen. Leider entsprechen auch die Bilder auf der Homepage nicht den derzeitigen Zustand des Ferienobjekts. The small village Buggow halfway between Anklam and Wolgast. Until the Baltic Sea to Zinnowitz is about 25 km away by car. The place is quiet at the edge of the forest, there are many animals: bees populating the orchard belonging to the plant. We sell own honey and apple juice. There are in the village cows, dogs, cats and goats belonging to a goat farm. On the coast, cycling can be, everywhere you can hire bikes. Boat trips on the Baltic Sea are offered with many excursion boats daily. Cot (per property per week, the tenant bring 20 EUR). Air conditioning (per object and day, included in the price 0 EUR). Parking (per object and day, included in the price 0 EUR).